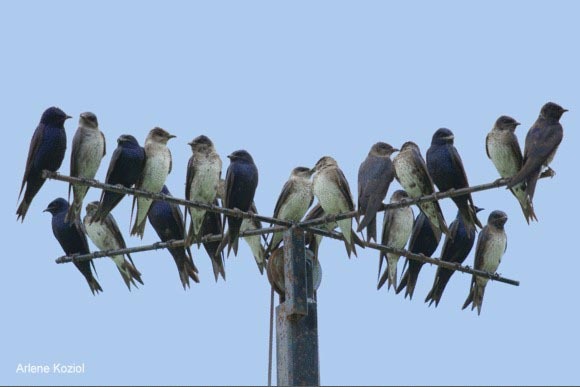 Some of Wisconsin’s most beloved birds – purple martins, chimney swifts, tree and barn swallows, Eastern whip-poor-wills, and common nighthawks – are in trouble and residents can learn more about why and how to help these birds around their home during an early September conference in Waukesha. The Sept. 6-8 event is the combined annual meeting of the Wisconsin Bird Conservation Initiative, a coalition of 180 groups committed to conserving native birds, and a summit of the 109 Bird City Wisconsin communities. Registration for the event (exit DNR), which includes evening field trips to look for one of these declining species, the chimney swift, closes Aug. 21. Registration closes Aug. 21 for a combined conference of the Wisconsin Bird Conservation Initiative and Bird City Wisconsin. Declining populations of purple martins and other aerial insectivores are one of the main topics participants will tackle. “Conservation groups have taken notice and are beginning to address declines in these beneficial insect-eating birds, but citizens can help too,” says Ryan Brady, a conservation biologist for the Department of Natural Resources and bird monitoring coordinator for the Wisconsin Bird Conservation Initiative. In Wisconsin, data from the federal Breeding Bird Survey indicate nearly a 2 percent annual decline in chimney swifts, a 4 percent decline in bank swallows, and a 7 percent decline in purple martins…each year! Brady says. These birds, as well as other swallows, some flycatchers, and even bats, are known as “aerial insectivores,” species that feed on their insect prey in flight. Causes of these declines are likely complex and involve multiple factors depending on the species, such as loss of foraging habitat, decreased availability of nesting sites, increased predation, etc., but the one feature these birds all share is their reliance on flying insects as a primary food source, Brady says. “Although solid long-term data is lacking, there is widespread belief that numbers of flying insects have declined dramatically in recent decades,” he says. Hale says that the bird conservation coalition and the Bird City Wisconsin organization thought combining their meetings would offer the opportunity to quickly expand efforts on behalf of these aerial insectivores. Previous articleBonus Fall Turkey Harvest Authorizations On-Sale: Aug 18 at 10 a.m.